La Petite Fashionista: Merry Christmas from Florida! I am so excited to spend Christmas at home in Florida with my family, and have my boyfriend visit my home for the first time. Christmas in Florida is different than anywhere else in the world-- instead of snowman building, we build sand castles.. we put lights on our palm trees, and it's not unusual to spend Christmas Eve watching the sunset at the beach. It's not a snowy white traditional Christmas, but I wouldn't trade it for anything in the world. 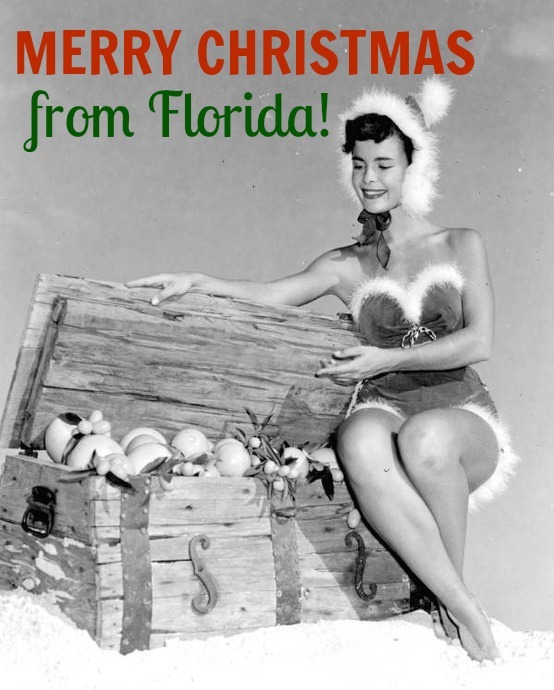 I am so in love with these vintage Florida Christmas portraits from the Florida State Archives. It perfectly evokes a classic coastal Christmas. I saw that you were back in town! I how you and the boyfriend have a great time (and enjoyed your Mr. Souvlaki's!)!! Have an amazing Christmas, Lauren! Yay! I've been loving your Instagram feed - hope you're having a wonderful time with the family!! !